Art is such a many faceted endeavor. I enjoy it immensely while on the other hand it seems a huge, frivolous and totally unnecessary expenditure of time. The Chair is for sale, $1000.00. The sale of it, although creating a huge loss of something I have put my creativity, my vision, my self into so deeply, would help expel the feeling of wasted time. It is guaranteed for 100 years if treated well. Besides, you would never find another one like it: with its genuine hand painted Hake tufts, dingle-dangles and oh so soft yellow poodle fur! I expect the street value of this chair on the streets of New York or Paris will easily fetch a King’s Ransom ! 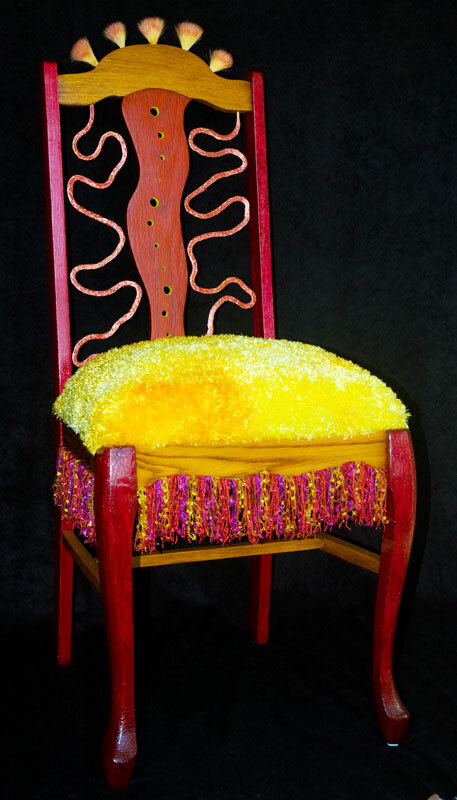 This is a fabulous piece that will easily enhance any ‘art chair’ collection. Art is anything but frivolous and unnecessary. It is the purest form of human expression. Never consider any artful thing that you do as a “waste of time.” It isn’t. Ever. And I agree with your brother. A king’s ransom, indeed. It is, simply put, a beautiful piece. Very nice, some mardi gras reveler would love to own this one!! Do I smell a road trip to N’awlins with this chair…???? Your finished chair is all inspiring. It is original and creative and “speaks” it’s own language. I agree with Bonnie, art is not wasteful, thank goodness we can enjoy art and be artists as well. A kiss may only last for a moment but what matters is the feeling. “Art ” is about the “feeling” one gets from the experience. Your chair is definitely a “good kiss” and not wasted at all. Your seemingly “waste of time” has filled a time void for many art seekers looking for something worthwhile. If you can’t find a partner grab a wooden chair!!! Where is the chair now…. ?